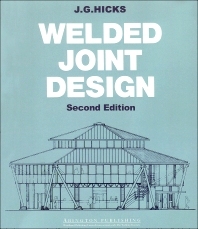 This is a highly illustrated guide to the design and performance of welded joints - principally in steel. It encompasses the static and fatigue strength of welded joints, the selection of steel grades from the point of view of service and manufacturing requirements, the design of components and structures, and the influence of fabrication methods and procedures on design. A brief overview of welding processes and inspection techniques is included. The revised second edition reflects changes in attitudes to material properties and quality management which originated mainly in the offshore industry and have now permeated other fields of engineering. This edition includes new sections on brittle fracture (including descriptions of fracture mechanics tests and their significance to the designer), and on fatigue and the performance of joints under tubular structures. A completely new chapter on quality assurance has been added, and the references to standards (UK, American and international) have been updated. This book has mainly been written mainly for practicing engineers and draughtsmen, but it will also be of value to students of civil and mechanical engineering as a link between the theory and practice of design. Arc welding processes; Steels and their weldability; Distortion and residual stresses; Terms and definitions; Weld preparations; Weld symbols on drawings; Static strength of welded joints; Fatigue life; Brittle fracture; Welding procedures; Quality management; Inspection and non-destructive testing. John Hicks has been a specialist in welding design for 35 years. A graduate of Cambridge University, he is a Certified Welding Engineer, a Fellow of The Welding Institute, and a Fellow of the Royal Academy of Engineering. He acts as Moderator of TWI examinations for European Welding Engineer/Technologist/Specialist, and from 1990 – 1996 served as Secretary General of the International Institute of Welding.